… committed tax fraud, and he was charged in 1598 with hoarding grain in order to resell it during food shortages? He was an astute real-estate investor. In fact, most of his income came from the renting of his properties. His wife’s name was Anne Hathaway, like the actress in Les Misérables. He was 18 when they married, and she was 26 and pregnant with their first child. 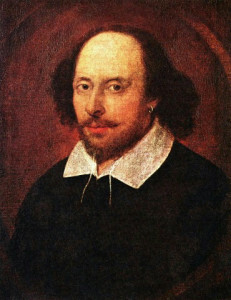 Because Shakespeare was from a humble family, there has been speculation that he is not the author of his works. His father was a leather merchant, and Shakespeare had to leave school at 13 to help his father.